Lakeview is a family run group of care homes situated in the beautiful seaside resort of Lytham St Annes in Lancashire. They have been providing the very best care since 1987. With its success and commitment to excellence, Lakeview required a more compelling website for potential residents. The Moorings' project provided the opportunity for a new, modern care home which would provide and facilitate a level of care which would be second to none. 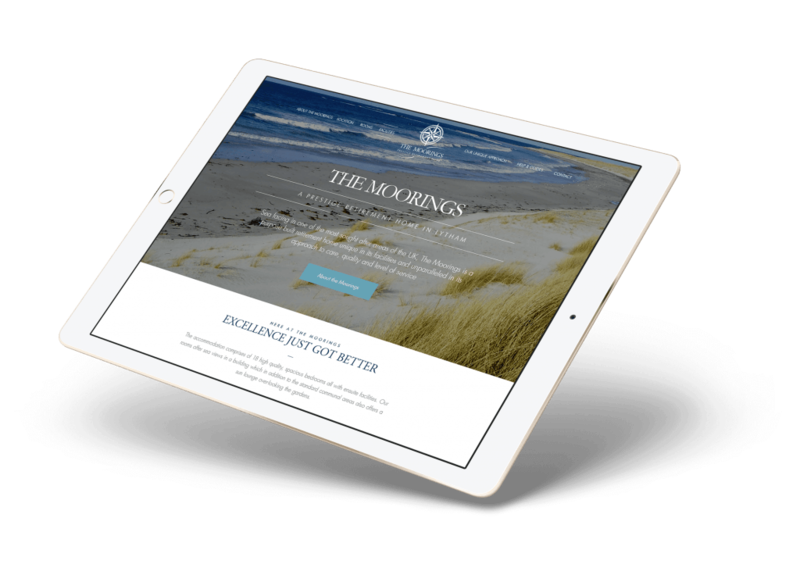 As medical website design and healthcare marketing specialists, our objective was to create an identity and website that not only drew from the beautiful surrounding area of Lytham St. Annes, but would instil a sense of luxury and heritage. We were aware that the target audience would be family members as well as potential residents. With this in mind it was key that the website had a clear user journey in order to achieve a high conversion rate. As branding and creative experts, we experimented with various compositions, a bold compass style graphic was chosen as the logo mark, along with Garamond as the supporting typeface. The website outcome was visually stunning. Using a combination of beautiful full width photography and carefully selected typefaces to create a contemporary yet distinguished feel. We designed the mobile site to be just as visually led as the desktop site. Using a simple fly out menu for ease of navigation, along with well positioned points of contact. Custom Icons were created in order to visually indicate different sections of the care home.